EFC Cabin is located in a cold, misty mountain surrounded by large oak trees. Situated on a hill, it provides sweeping views of the surrounding landscape. EFC Cabin is a warm and cozy accommodation in the midst of the cold mountain air. The cabin has a central volume housing the functioning parts of the house. It has the laundry room, bathrooms, and kitchen. A focal point of the living area is a suspended fireplace. There is a sense of unity between the outdoors and the indoors. The bedrooms, living and dining areas open outside, toward the valleys and mountains. This open layout establishes the close interior/exterior relationship. A focal point of the house is a fireplace suspended from the ceiling. 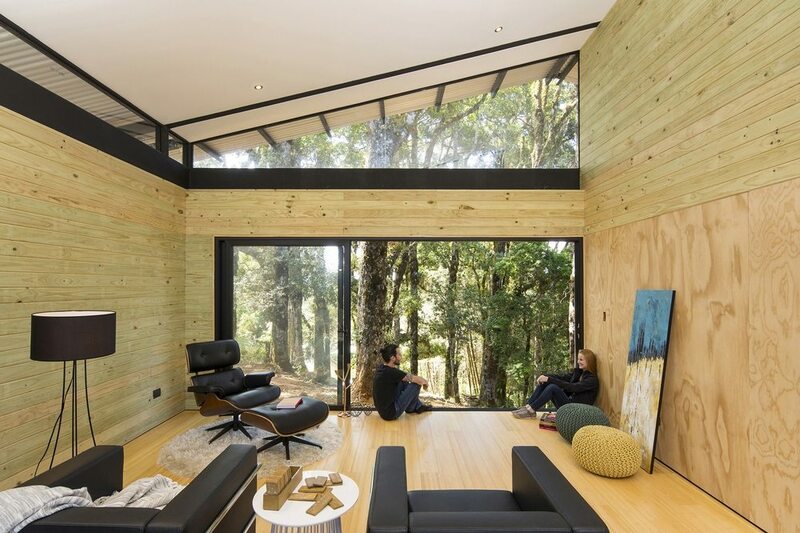 EFC Cabin highlights the beauty of the landscape, making the environment the star of the show. It is a warm and cozy accommodation in the midst of the cold mountain air. The EFC cabin, a respectful intervention, is situated in the context of the cold and foggy mountains of Dota, over a hill surrounded by a small forest of oak trees that make up the scenery for this dichotomous project. The visuals, the landscape, orientation, winds and access points were key for the distribution of the program. EFC is an answer to the study of the stereotomy and the tectonic. The project involves a central volume equipped with all the serving spaces required for the adequate functioning of a home: kitchen, bathrooms and laundry room. That is, there are a series of wet spaces focused in the nucleus of the cabin, in such a way that there is efficient use of the resources and installations, and the space for the served areas is liberated. Here the outdoors are integrated with the indoors, being merged together and becoming one. It arises as a stereotomic mass, solid, rocklike, heavy and monolithic that sets itself above ground as if it was born out of it: a continuous, monolithic system that is perforated and sculpted to allow light in the space and its habitability. Next to this volume, the served spaces, living, dining and bedrooms, are directed to both sides in such a way that they open on one face to the valley and mountains and in the opposite direction to the oak forest. The interior/exterior relationship makes the environment the main protagonist of the space. It is projected as a tectonic architecture, meaning of assembly, open and light. It is an architecture articulated between pieces of radiata pine wood, plywood and metallic structures that look for support and cling to the mass, a combination of materials that bring warmth to the space within an already cold context. It is a frigid environment that generates a harmonious contrast between the cold and the warm, the stereotomic and the tectonic, the natural and the man-made, the serving and served spaces to be discovered, inhabited, experimented and lived in by the user. Another home from the same architect is Tropik Works.